It is rare that a consequential painter’s childhood is as unknown as that of Jean Geoffroy. He was born on March 1, 1853 in Marennes, a fishing port on the western coast of France, and left there sometime after the birth of his brother, Charles, on February 5, 1855. Charles died seventeen months later in the sixth arrondissement of Paris in the summer of 1856. Why, or precisely when, the Geoffroys moved to Paris remains unknown. Geoffroy’s parents are somewhat better documented. His father Jean-Baptiste (1823-1895) was a costume designer and his mother Rosalie (1826-1911) was the daughter of the English painter, John Dickinson. [i] Dickinson himself moved from Manchester, England to Marennes, perhaps in search of scenic subjects for his art. Once there, he had four children with a local woman before marrying her and producing four more. Sadly for Rosalie, she was the oldest of the children and thus, the subject of social ostracism before of the circumstances of her birth. It may be that the Geoffroy family’s move to Paris was a means of removing themselves from an unwelcoming social environment. In addition, it is possible that Jean-Baptiste’s professional prospects would have been better served by the economy of a larger city. Once the Geoffroys moved to Paris, little is known of their family life. They had no more children, and there is no record of their address beyond the death notice of the infant Charles in the St. Germaine neighborhood on the left bank of the city. Based on scant references to Rosalie’s involvement in her son’s life, it would appear that she and Jean-Baptiste did not live together more than a few years. The young Geoffroy seems to have done well at school. In 1867, his first year there, his drawings were included in an annual exhibition reviewed by the emperor Napoleon III. The exhibition listing for him read: “the student Geoffroy, age 14 and a half, decorative painter: One composition executed in 3 hours and one flower drawing from nature executed in 8 hours.” [iv] Speed of execution would have been an important skill for a designer hoping to obtain a job with one of the manufacturing enterprises of the time. Regardless of Geoffroy’s puzzling family history, he emerges in 1870 living on his own at 48, rue du Faubourg-du-Temple in the eleventh arrondissement, just a few blocks northwest of the Place de la République. Among his neighbors was a middle-class couple, Louis and Julie Girard, who operated a private school, the Institution Girard. This day school for boys occupied half of the ground floor of the building; Geoffroy’s modest apartment was on the top floor. Although only seventeen himself, he found a number of his models among the young students who were continually gathering in the courtyard and adjacent streets. Louis Girard and Geoffroy quickly developed a wholehearted friendship that would last a lifetime, and that would provide the artist with a sense of family unlike any that he had previously known. The early 1870s, following the end of the Franco-Prussian War, was a time of chaos, not only for the government but also within the art community. Dissatisfaction with the official Salon had been brewing for a decade or more, and the disruption of the war forced many young artists to examine their own positions about the future of art. The group that would become known as Impressionists proclaimed their freedom from officialdom with an independent exhibition in 1874; and although the core group of Edgar Degas, Claude Monet, Berthe Morisot, Camille Pissarro and Pierre Renoir were the instigators of this effort, the majority of the participants were Realist painters who had been fighting for aesthetic acceptance since the 1860s. Geoffroy shared the interests of the Realists in the social issues afflicting the poor and disenfranchised, but the formal challenges of modernism were of little concern to him. In this respect, he combines the traditional painting techniques with what was then considered a radical social agenda. During the mid-1870s, Geoffroy also met Jules Hetzel (1814-1886), editor, publisher and ardent républicain. Like Bin, Hetzel had fought against the monarchy of the Second Empire, and had exiled himself to Brussels until after the end of the Franco-Prussian War. On his return to Paris, he began to publish presumably scandalous poems by Charles Baudelaire and the socialist essays of Gustave Courbet’s friend, Pierre-Joseph Proudhon. From Geoffroy’s perspective, however, the most important publications were the children’s books that Hetzel hired him to illustrate. Geoffroy’s work as an illustrator of children’s literature reveals his consummate talent at capturing images of childhood. Although the children’s faces are typically innocent and open, their physical poses often suggest more individualistic qualities—the determined walk of a toddler in pursuit of her buggy or the comic poses of a group of girls learning how to “manage” their umbrellas. There are also children in trouble or despair—dressed in filthy rags and depicted in a straightforward Naturalist style. As he was developing his skills as an illustrator for Hetzel, Geoffroy also experimented with his personal signature. In 1877 and 1878, he signed his work as Jean Dickinson, a French version of his English grandfather’s name, John Dickinson. Again, this raises the question of his grandfather’s possible role in the young painter’s life. There is no evidence that Geoffroy had any contact with his parents after 1871, but this signature could also have been meant to honor his mother and her family. A few years later, around 1880, the painter began to sign his works as Géo, the nickname by which he is still known today. In 1879, Geoffroy’s supply of child models expanded considerably when the Institute Girard run by his adopted family opened a boarding school near their home at 54 rue du Faubourg du-Temple. Suddenly, the painter had an abundant and ever changing supply of children who might serve as inspiration for his work. Some of them can be seen in the 1880 painting, Un Future Savant (A Future Scholar), Geoffroy’s Salon entry for that year. Paintings from the early 1880s tend to be focused on a small group of figures or even a single child such as Un Malheureux (An Unhappy Child), but as Geoffroy built his reputation and skill, he received more commissions for large, multi-figure compositions. This new development was undoubtedly fostered by his participation as a member of the Commission on Educational Imagery beginning in 1882. In this capacity, the artist contributed to decisions about how images could best be used as teaching tools in the classroom. Increasingly, his own work focused on educational access for all children; and in 1885, he became an Officer of Public Instruction, one of the highest honors awarded by the French educational system of the time. Likewise, his work as a painter began to attract more and more attention. In 1883, he received an honorable mention at the Salon des artistes français; and in 1886, he received a third class medal as well. In 1887, with well over a decade of public service to public education as well as a track record of excellence in painting, Geoffroy was recognized as a Chevalier of the Legion of Honor. 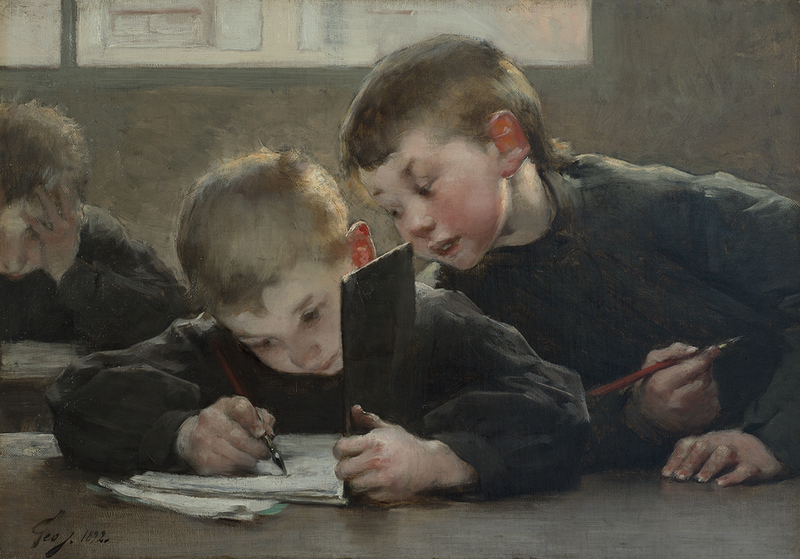 At the age of thirty-four, the working class boy from Marennes had not only been acknowledged for his contributions as an artist, but also as a committed advocate for children. Geoffroy’s world came to a dramatic halt in 1890 with the sudden death of Louis Girard, his friend, neighbor, and in all likelihood, his surrogate father. Julie Girard was left destitute with two children and almost no resources. Fortunately, Geoffroy was able to purchase a new house in December at 7 rue des Lilas in the far northwestern nineteenth arrondissement. The gate was apparently rusty, but nonetheless the house had beautiful panoramic views from its hilltop site of both Paris and the plains of St. Denis. Although thoroughly urban today, this part of Paris was still somewhat rural in the 1890s, offering residents a quiet, bucolic neighborhood. Mme. Girard and her children made their home on the upper floor of the building and Geoffroy lived on the first level. Three years later, the painter accepted a commission from the Ministry of Public Instruction for five large murals to be displayed at the Pavilion of Education at the Exposition universelle in 1900; this allowed him to purchase some adjacent property, expanding his studio space to accommodate the scale of the new project. The subsequent years were spent gathering images and information in preparation for the five murals. To that end, he traveled to Algeria and Brittany, sketching extensively to capture images that would depict the critical importance of providing education for all children living under the French flag, whether in Paris or in the colonies. The goal was to demonstrate France’s commitment to education for all people, emphasizing the underlying principle that an educated public will make rationally informed decisions for the good for the nation. Geoffroy won a gold medal for this work at the Exposition universelle in 1900. In 1903, Geoffroy showed Variot his large triptych L’oeuvre de la Goutte-de-Lait,(The Work of a Drop of Milk), a monumental composition intended to inform the public about the benefits of sterilized milk through a clear visual narrative. The left panel shows a newborn baby being weighed shortly after birth; the central panel is full of healthy children and smiling mothers who surround a new mother as she listens carefully to the doctor’s advice about using sterilized milk; the right panel shows the young mother receiving her supply of sterilized milk in a bottle. The painting was shown at the Salon of 1903 and subsequently purchased by the state; it was on exhibit at the Petit Palais until 2016 when it was transferred to the Musée de l'Assistance Publique–Hôpitaux de Paris. Variot and Geoffroy became close friends as a result of their collaboration on these public health issues. Together with Variot’s wife and daughter, they dedicated themselves to a variety of public health campaigns, always with an emphasis on assisting the poor and working class people on how to improve the quality of their lives. One other painting that deserves comment from this period is a scene of a young woman giving up her newborn child to an orphanage, A l’hospice des Enfants-Assistés, l’abandon d’un enfant. This canvas dates to 1912, the year after Geoffroy’s mother Rosalie died. She had been living close to her son’s home in the nineteenth arrondissement for some years, thus raising again the question of whether there was any contact between them prior to her passing. The subject of the painting is unusual in the artist’s work and may represent his own apparently mixed feelings about his mother’s death. The onset of World War I created a fresh set of circumstances for the painter. He continued to receive numerous commissions, but the subject matter from these years is more light-hearted. Although this may seem surprising in the middle of such an intense conflict, it may have been one way to offer an alternative to the persistently grim horror of the news from the trenches. 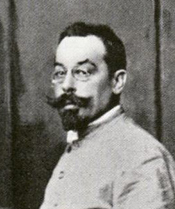 Following the war, Geoffroy traveled frequently with Dr. Variot. both to regional hospitals where he would provide images for teaching patients about new health practices and occasionally simply on holiday to Variot’s country home in Brittany. On one of these trips, Geoffroy returned to the region where he was born, probably for the first time since his family’s departure in the 1850s. As he approached the beginning of his seventh decade, Geoffroy turned his attention to working in charcoal on paper, pastels, watercolors and lithographs. Children continued to be his primary subject. The images are freely drawn or painted, often featuring a single child who is completely absorbed in a particular activity. [ii] Dominque Lobstein, Jean Geoffroy dit Géo, “Une oeuvre de généreuse humanité” 1853-1924, Exhibition catalogue (Saintes, France: Le CroÎt vif and Musées de la ville de Saintes, 2015) 27. [iii] For more information on Jean-Jacques Rousseau’s influential thinking on education, see his seminal publication, Émile, ou de l'éducation, originally published in 1792. A recent English translation was published by Hardpress Publishing in 2012. Geoffroy is likely to have been familiar with this book later in his career when he became personally involved in the cause of public education for all French children. [v] Lobstein, 27, Note 6. [vi] See Henri Frantz, “Jean Geoffroy” Le Figaro illustré, mai 1901: 1-24.